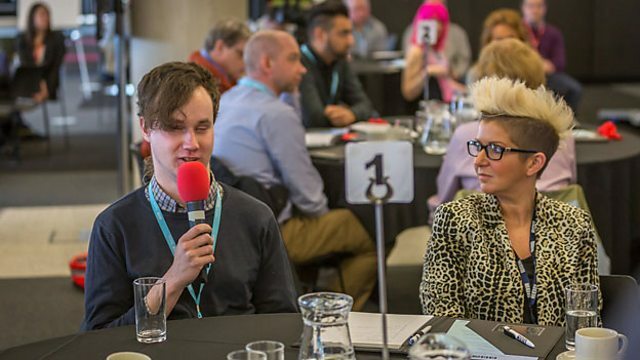 A year ago Ben Mustill-Rose, a developer who is blind, attended a PDT event in Salford, two weeks ago he joined the BBC as a Developer in Test, here he charts his journey. It’s just after 7am and I’m on a train, traveling to a school to do some testing for an app we’re about to launch. A year ago I was unemployed and probably still asleep; now I work for one of the largest media organisations in the world and I’ve turned into one of those annoying people on the train who insists on taking up all the table space with their laptop. My introduction to the BBC came in the form of attending a People with Disabilities in Tech (PDT) event in Salford this time last year. I wasn’t completely sure what to expect but I reasoned that since it was a free event I didn’t really have a huge amount to lose and the alternative was sitting at home continuing to look for a job in tech. The PDT event was part of a series of free, open door sessions that are designed to encourage a range of more diverse people – including women and people with disabilities – to apply for tech jobs at the BBC. I felt very welcome on the day and I really enjoyed finding out about what it’s really like to work at the BBC. As someone with a disability it was particularly good to be able to talk to other disabled staff to find out what support is available, for example Assistive Tech and Access to Work. In addition there was a huge amount of info on offer about the tons of tech products they work on, for example what it’s like to build a platform like iPlayer that gets hundreds of millions of requests per month. Or to hear from the team that design games played by millions of children or to learn how the BBC has automated the monitoring of all their online real estate. That’s just a taster of the sort of information you learn at one of these events – it’s all pretty impressive I’m sure you’ll agree. Having attended the event I decided to apply for the BBC’s Extend scheme. Extend has changed a bit this year but at the time ‘Extendees’ were given a 6 month placement within one of the BBC departments, the idea being that at the end of the placement you’d be in a good position to apply for further work at the BBC. I’m always hesitant to apply to things like Extend – as a rule I tend to lean more toward mainstream opportunities, but I was (rightly) encouraged to think of it as a foot in the door that would enable me to prove myself. I could write an entire blog post on the things that I’ve done in my placement and still not scratch the surface. As a developer in test within mobile iPlayer I’ve been doing all the obvious things like developing and testing but even those two things warrant blog posts of their own. We do lots of test automation in iPlayer so some of my work has involved extending our existing tools in tandem with running manual tests and helping other teams in adopting our testing practices with a small amount of devops mixed in for good measure. I also spend quite a bit of time giving UX/accessibility type advice to other teams. I’ve had a noticeable impact on lots of other products that have yet to be released which is a really great feeling; I can’t quite believe how much responsibility I was given from day one – I definitely got thrown in at the deep end but fortunately I enjoy a challenge! Something that I wasn’t aware of before I joined is how much outreach the BBC does. I’m now a STEM ambassador which sees me represent my department at various careers fairs / STEM events which is always incredibly satisfying; I really enjoy giving something back and I’m thrilled that the BBC recognise the importance of these sort of activities. At the BBC we do things that change the world and we’re building things that nobody has ever built before. Every day that I go into work I know that the things I’m doing are making a real difference both externally and internally and it’s for these reasons that I was delighted to accept the offer of a permanent developer in test role on the iPlayer team a couple of weeks ago. I’m the living proof that if you’ve got the right skills then it really is possible to go from attending a Diversity in Tech event to working on some of our flagship products.